This product is no longer available on Better Braces. If you would like this product, please complete the order form here, and contact Customer Care at 800-336-3569. Prescription Only. Provides cold therapy for the temporary reduction of swelling and pain after surgery or injury. 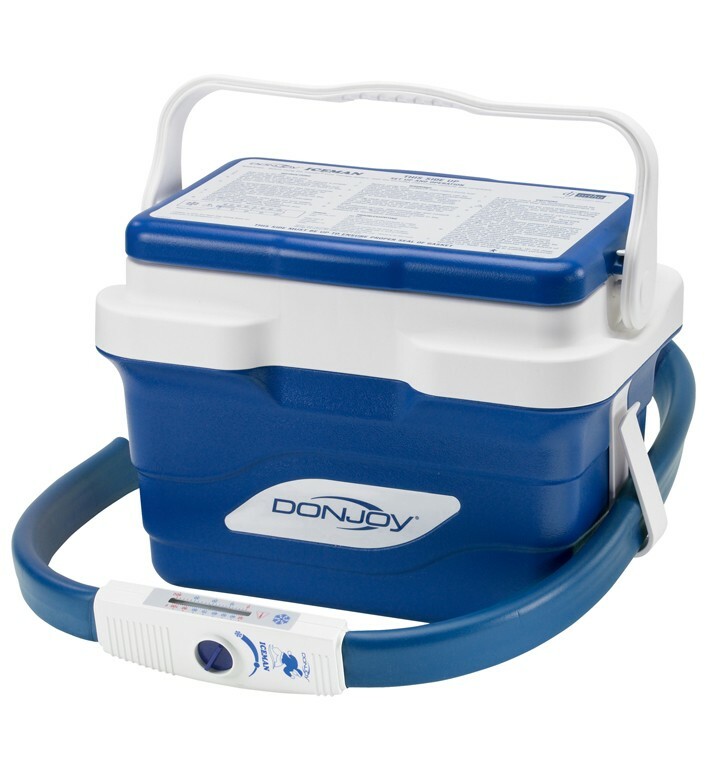 The DonJoy Iceman by DJO is one of the industry's most recognizable sports medicine products for cold therapy. The Iceman cold therapy system (includes container and wrap combo) is used by orthopedists and sports medicine professionals following a variety of arthroscopic joint procedures to assist in minimizing pain, swelling, and inflammation by providing up to 7 hours of continuous cold therapy before needing to be refilled with ice. The cold therapy unit is connected to your choice of a wrap-on (included) or cold pad which surrounds the joint with up to seven hours of cold pain relief. Compared to other cryotherapy machine products, the DonJoy Iceman uses a patented semi-closed loop system which allows the unit to maintain a more constant and accurate temperature than competitor's systems. The Iceman also features a thermostat for easy temperature adjustments. This system is shipped complete, ready for immediate use and includes: Iceman cooler, pump with hose attached, and a three prong AC adaptor. In order to add this item to your cart you will need to upload an image of your prescription to your order; you can either take a picture or scan it in into your computer or smart phone. Once the file is on your device select "Choose File" near the Add To Cart button to find and upload the copy of your prescription. Once your order has been placed your order will be put on hold until the prescription has been verified which may take 1 or 2 business days. Your order will then be released and processed for shipment. *Note* In order to successfully verify and process your order you will need to obtain a valid signed prescription from your physician. We will not accept an electronically signed prescription. The signed prescription needs to have the physicians name, address and phone number, as well as their NPI#, without this documentation we will not be able to fulfill your order. Make an appointment with your local doctor to have a prescription written for this item. You may also want to email or print the product information to give to your doctor. The Iceman Cold Therapy unit helps reduce pain and swelling. Using a patented semi-closed loop system, the Iceman maintains a constant temperature. This device can cause serious injury if not used properly. Follow your physicians instructions on how long to use the device and when to use it. Frequently check your skin for increased pain, burning, numbness, tingling, discoloration, blisters, irritation or other changes in your skin condition. If you experience any of these conditions, stop use immediately and consult your physician. This product does not qualify for Special Discounts or Free Shipping. Replacement pads and charger available for purchase. The Iceman Continuous Cold Therapy Unit is regulated by the FDA and requires a doctor's signed prescription. To place an order you will need a prescription from your doctor, and to upload it to the website before adding the item to the cart. Please call us with any questions at 800-553-6019. Is it possible to use/get this unit with the foot cuff? The Iceman Continuous Cold Therapy Unit is not available for sale with the foot attachment. The Universal Iceman Cold Pad would work to wrap around the foot and ankle, unfortunately we do not have a pad for the foot specifically. I've used my machine for 2 days and it seems like it's not pushing out the water. The pump doesn't seem as load as it was the 1st day. What do I need to check on it to try & fix it? Do you need a prescription if you are not using insurance? Yes, a prescription is required to purchase this item. Does the universal pad fit around a foot? Yes, the universal pad can be used on any body part. Can a new pump be ordered for the Donvoy ice machine? I had very bad accident and a lot of lower leg surgeries . Have had Iceman universal pad since left rehab in Feb. Pad is coming apart at the top and seems to be leaking. Should I just order a new pad or would you recommend a knee/leg wrap. We have a DonJoy Iceman , it was used for my husband's use post back surgery, I will be having knee replacement surgery in a few weeks, can I just purchase the pad for my knee? How many amps or volts is the transformer? My machine is 10 days old and the top half of the knee pad does not fill with or circulate water. There are a lot of air bubbles inside the pad and when unplugged the top third of the pad has no liquid, only air. Only the bottom third of the pad cools leaving the top warm without any water visible. What if anything can be done to correct this problem. 1. The machines sound is loud and it increases as the ice melts, is this standard if not why? 2. As referenced above you state the cold ice water lasts 7 hours, what should be the recommended most efficient number of hours before re packing with ice? 3. What is the warranty on this product? What does the shoulder cuff look like that is included with the Iceman Continuous Cold Therapy Unit. There is no picture and the description does not match any of the shoulder pads you sell separately. I am a registered nurse with bad knees. I've had multiple knee surgeries. ice therapy has been a top priority in pain relief. This product provided excellent cooling therapy. I've had my cooler for three years and have had no problems. A must-have especially post surgery in those Long days of being on my feet in the cardiac cath lab. I got one of these iceman machines 13 yrs ago. It finally started breaking down. But Ive had multiple knee surgeries, multiple ACL reconstructions, etc. and I LOVE this machine. It has helped me through some extremely painful times. I have seen several friends with machines similar to this but without the pump feature. Believe me, the pump feature is night and day different. Get one of these, you will not be disappointed. Pros: Adjustable temp and ease of use. Keeps cold for 8-10 hrs. I was referred to you by my spinal doctor (Dr. Michael Saulino) for the Don-joy ice machine clear 3. After speaking with Christine about the benefits of both products, we decided to switch products to the older "Classic cold therapy unit". Christine informed me that if I include the large pad I can use the product for my knees (both operated on in 2015), my back (last surgery 2015) and my shoulder which was operated on in 1993 but the arthritic pain is horrible. I entered my senior season of football knowing that I need shoulder surgery for which I was told by our team physician, "Don't worry, we can 'juice you up' with cortisone weekly. Being young and dumb, I took his advice. Christine also showed me one of your back braces which might relieve some of the pain when I'm walking, By no means was she pushy. I actually questioned her to see if I was not missing anything of benefit because I wanted to take advantage of the 65% discount. Bottom line - I praise you for hiring such a smart, kind and loving person. I'm sure I went above and beyond all my medical calamities with her, but she held my hand and made me feel...OK.
Great price for an invaluable machine that made my recovery from surgery quicker, and is still helping reduce soreness after therapy sessions. Used the Donjoy Iceman after knee replacement. It is wonderful; could not have asked for more. It stayed cold for longer periods of time, compared to just an icepack. I highly advise the use of this product. Cons: The hose is a bit difficult to keep in place, but I learned to put a heavy towel over the pad (once in place) and that helped keep the hose in place. Not as cold as an ice pack. Sure you don't have to change it out every 20 minutes but an actual ice pack is a lot more colder and effective than this machine. You would think for 150$ this would do the job as they reps advertise. Great concept but poor functionality. Works great with no mess!